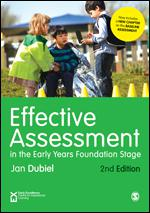 We’ve got five signed copies of Jan Dubiel’s Effective Assessment in the Early Years Foundation Stage to giveaway. All you have to do to win is look out for the Effective Assessment in the Early Years Foundation Stage tweets we’ll be posting using #EYAsmt from 6th February, and retweet them. Winners will be chosen at random at 5pm on the 10th February.